Always Think Bigger: It's here! It's here! I am so much of one that Annie has a planner, I have a planner for personal stuff and a teacher planner for school (with matching stickers and cell phone cover) and I give them at the end of the year for teacher gifts! Well, this holiday season, I decided to get Erin Condren Gift Tags. They are so pretty and I wanted to do something that would make my gifts look special for our friends and family. This seemed like the perfect way to set our things apart from everything else. But, there was a glitch in my plan. They weren't here! I have been waiting and waiting and waiting. My order was delayed and I was getting concerned about when they would arrive so that I would be able to use them on gifts for our friends and family. I had emailed back and forth with customer service and I was VERY concerned with when my order would arrive. In the meantime, I had also ordered Holiday Postcards and I was very worried that my holiday postcards had still not arrived either. Needless to say, imagine my surprise when I got hope to see one of those awesome Erin Condren FedEx boxes sitting on my kitchen counter! Check out what was inside!!! 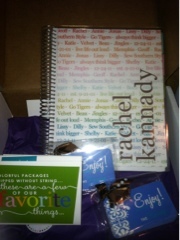 My new planner with my "favorite things" and my name and my holiday gift tags! Who can be upset with a thing of beauty like that?!? And who doesn't love sitting down and writing all their dates in their planner. I always feel like it keeps my brain attached for me! Simple Solution Sunday: Tervis Addiction! 6 months of cuteness in pictures!